The last time I was out of town on a long weekend was in Bacolod during Holy Week, but sadly I wasn't able to enjoy it thoroughly because the Philippine population is 86% Roman Catholic, and Roman Catholics take Holy Week seriously, shutting down their businesses even when they know they can profit largely from vacationers on holiday. National Heroes Day (August 25th) thankfully fell on a Monday this year and since it isn't a Christian holiday, I had high hopes that I'd have a much more enjoyable time on my trip to Cebu. I went with a friend who had already been there a few times but still agreed to do touristy stuff with me. First on our itinerary was Magellan's Cross. 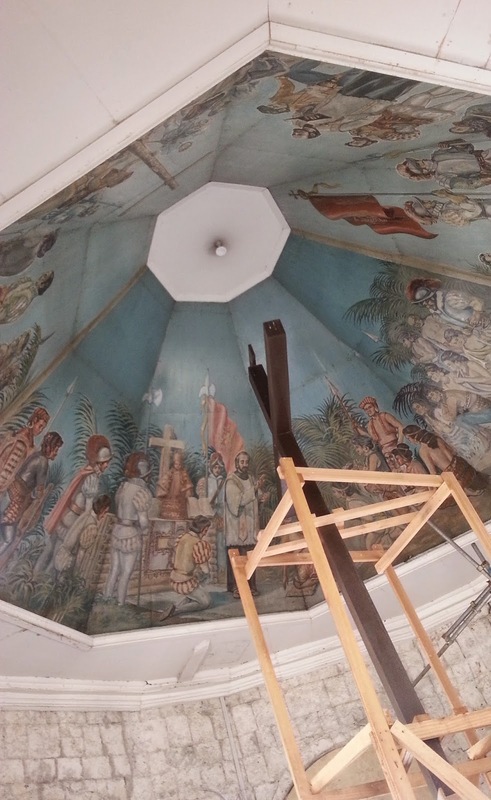 Magellan's Cross is the original cross planted by Magellan and the Spaniards when they arrived in the Philippines more than five centuries ago. It's covered in tindalo wood now, however, allegedly to preserve it, but I couldn't help but think the actual cross may have already been relocated. I had always envisioned Magellan's Cross and the chapel that houses it to be gigantic structures, but that proved to be just an illusion when I finally caught sight of the place in person. Literally just an illusion because the only reason the cross looks so big in photos is the upwards angle it is almost always taken in, against the seemingly vast ceiling as backdrop, with no other object around it to scale it with. 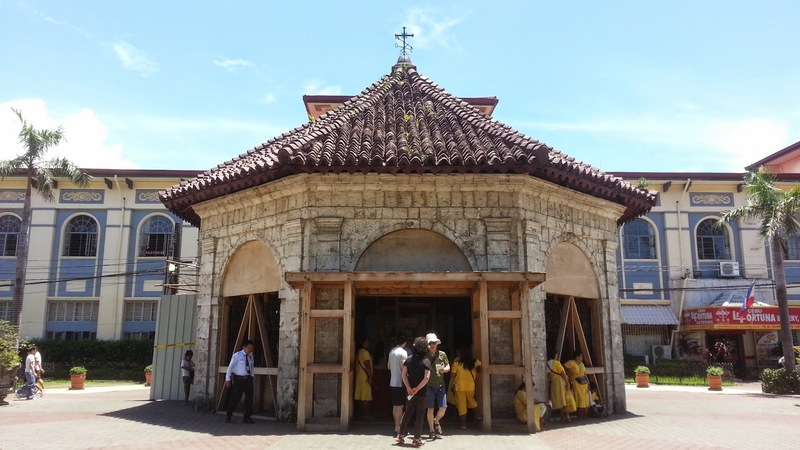 The entire chapel has been under repair for a few months now, because of the damage caused by the 7.2-magnitude earthquake that shook Bohol last year, so in addition to the women in yellow Sto. Niño uniforms peddling colored candles and prayer dances to tourists (one woman's "Para sa love life ni Ate Cheche" dance stuck with my friend and he was imitating it comically throughout the entire trip), the place, including the cross, is also surrounded by wooden support, which at least we can now scale it with in recent photos. 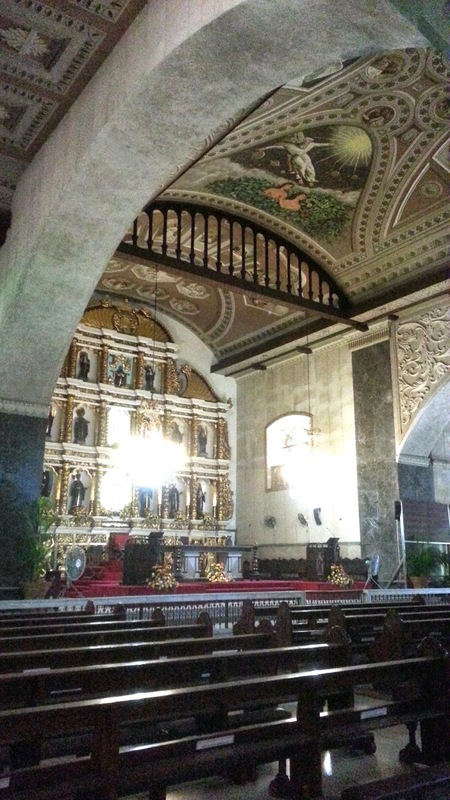 We visited the Basilica Minore del Santo Niño next, as it was just a short walk away from Magellan's Cross. There was a program of some sort going on at the plaza. The church was still closed to tourists though, so we just glimpsed the interiors from outside. 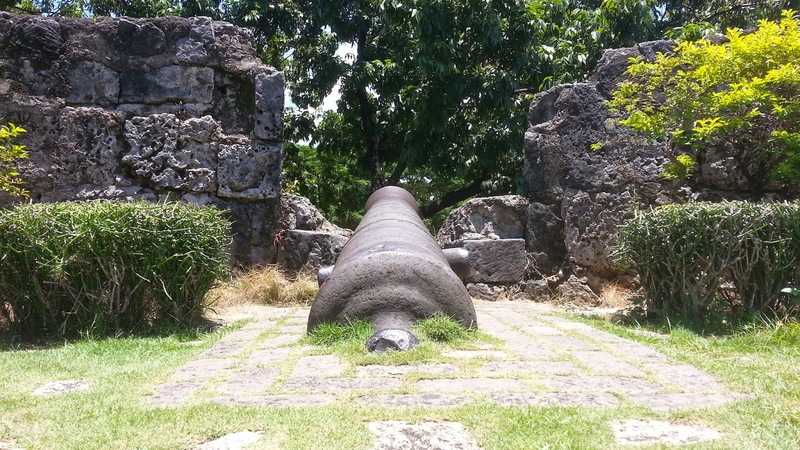 Another short walk away and we were at Fort San Pedro in Plaza Independencia. 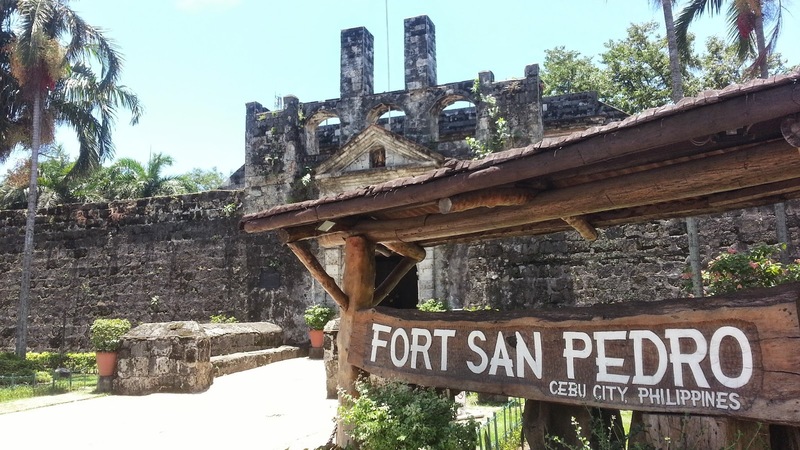 Built in 1738, Fort San Pedro is the oldest bastion fort in the Philippines, serving to repel invaders during that period and the Philippine Revolution. There were lots of Korean tourists that Saturday and it seemed they were much more interested in what they were seeing than we Filipino visitors were. After all the walking, we finally decided to have lunch at IT Park. And where else to do it but at the famed Zubuchon. 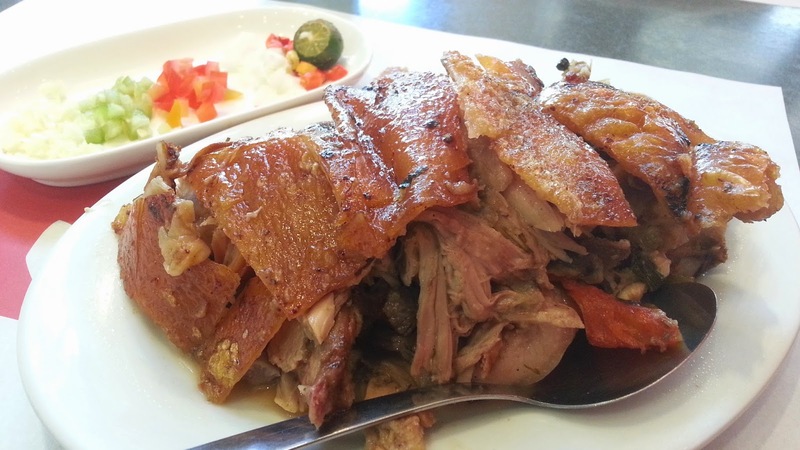 Zubuchon's name is a portmanteau of the ancient designation for Cebu and lechon. 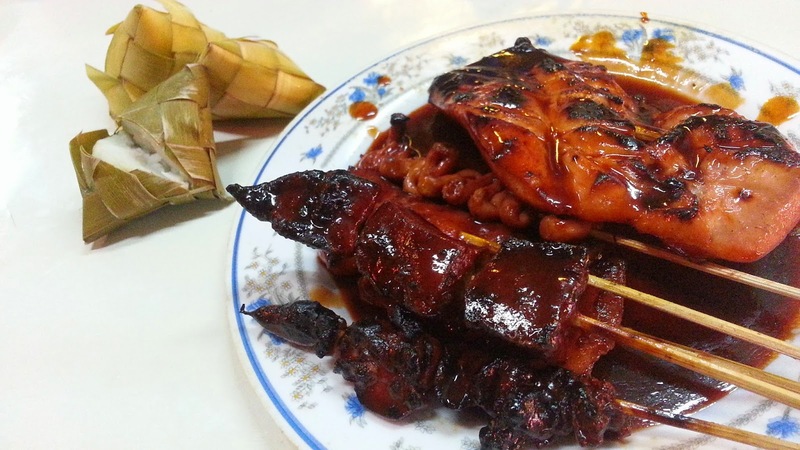 They make their lechon old-fashioned, without using any mixes or MSG to improve the taste or blowtorching the pigs to get that smooth and evenly caramelized skin we usually associate lechon with. Though they cost a bit higher than your regular roasted pig, I think they're well worth the price. 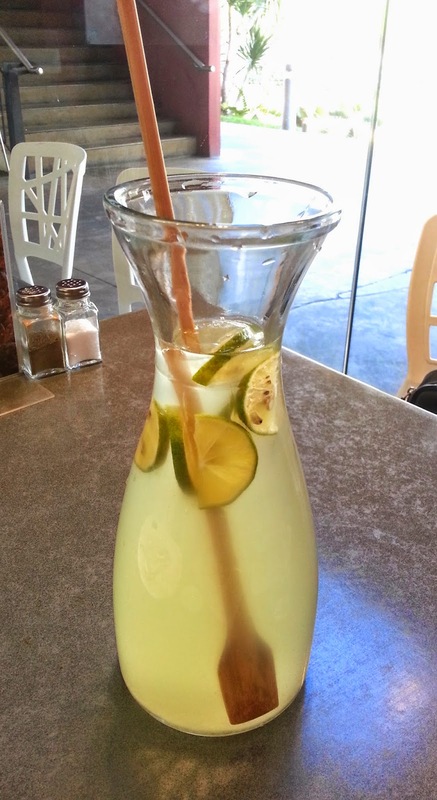 My friend and I ordered half a kilo of it, only a cup of rice each (there were already enough calories in the pig) and a pitcher of iced lime and lemongrass tea to wash it all down. We were able to finish our meal despite our lechon order being enough for three or four persons. Anthony Bourdain was right in proclaiming Zubuchon's lechon the "best pig ever." 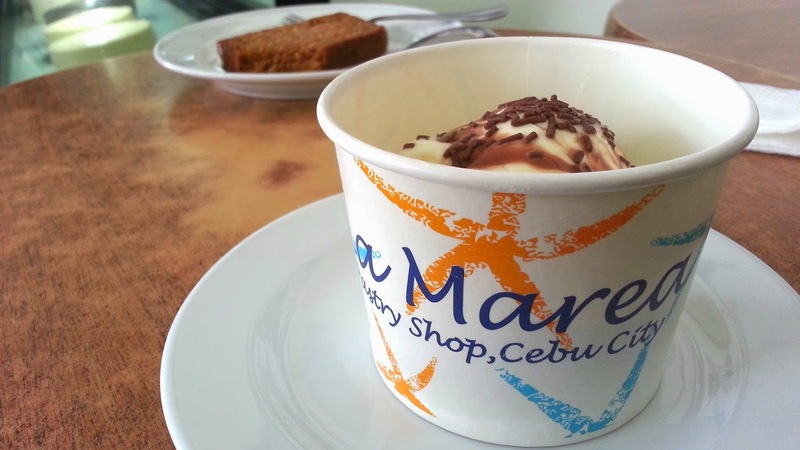 For dessert, my friend Cams recommended La Marea, a pastry shop also at IT Park with a sea-inspired interior (starfish on their paper cups, a collage of fishing photos hanging on the wall), which makes sense as "La Marea" literally means "the tide" in Spanish. None of their pastries relate to fishing or the sea, however, and despite their use of the font Brush Script for everything, people still seem to flock to their shop, particularly for their warm brownie cup. La Marea's warm brownie cup is literally warmed brownie fudge in a cup with a scoop of vanilla ice cream and chocolate sprinkles on top. It disappointed me, probably because with a cup like what they served my order in, one would expect the contents to be a lot. But they weren't. 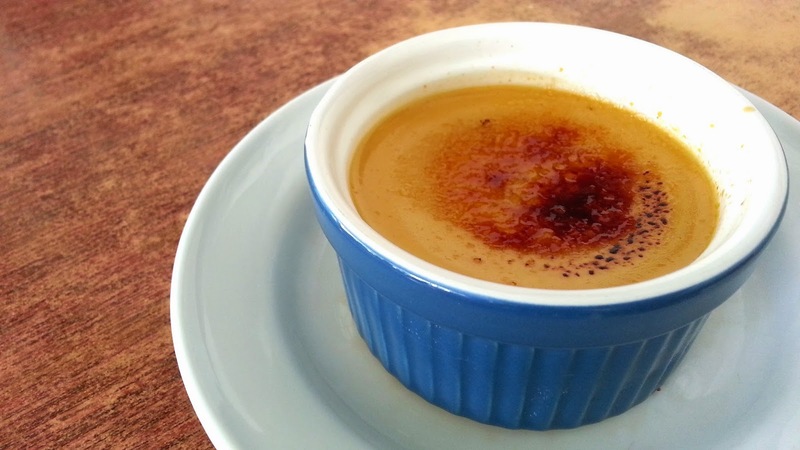 We also tried La Marea's creme brûlée, mango pastry a la mode and a slice of carrot bread—none of them special, but hey, I've got a sweet tooth and those were desserts, so no complaints. Next on our itinerary was catching the sunset at Tops Mountain Lookout, so after we freshened up at our hotel, we rode a habal-habal (for P150 per head, back and forth) to the place for about twenty minutes, and joined about three dozen Koreans and several Filipino couples in taking photos of the view. 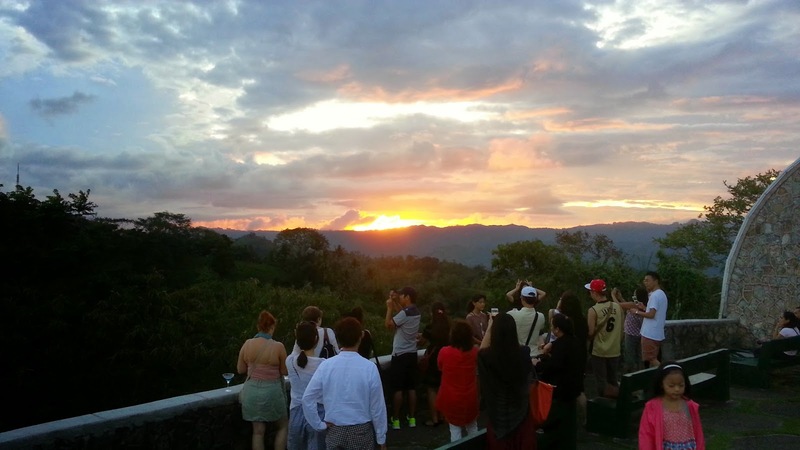 Tops Mountain Lookout, more popularly referred to as just Tops, is located in Busay, north of the road that leads to another tourist destination in Cebu, the Taoist Temple. It was cold at Tops, understandably because of the high altitude (around 2,500 feet above sea level), but there were stores there serving alcohol and coffee to help keep tourists warm. 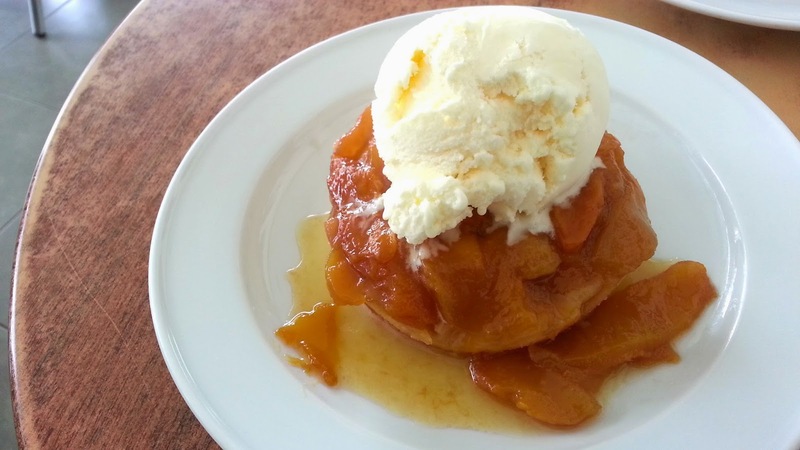 We didn't stay long because we were already getting hungry and we knew it would be too cold riding down the road on a habal-habal come nighttime. 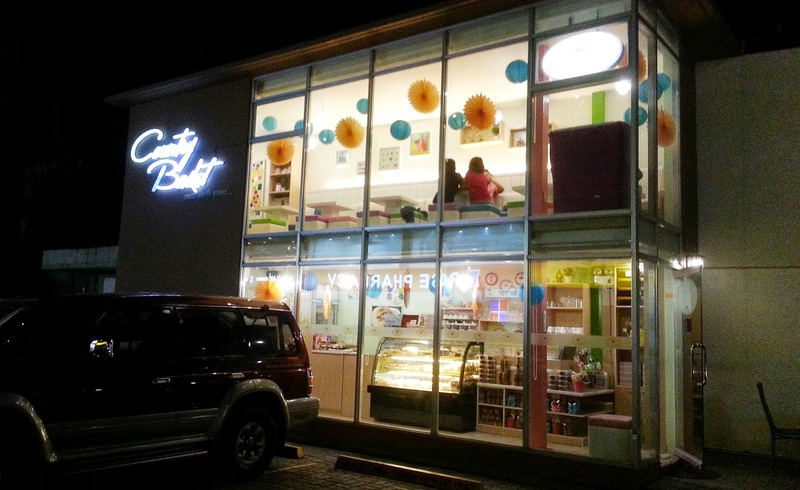 But instead of getting straight to dinner after leaving Tops, we had desserts first, mostly because it had started raining and this pastry shop called Country Basket was the first dining establishment we had come across. Country Basket is tiny and—though I usually refuse to use this adjective—cute. It has two floors. The first is where you see all their offerings and order, and upstairs is where you can get seated. 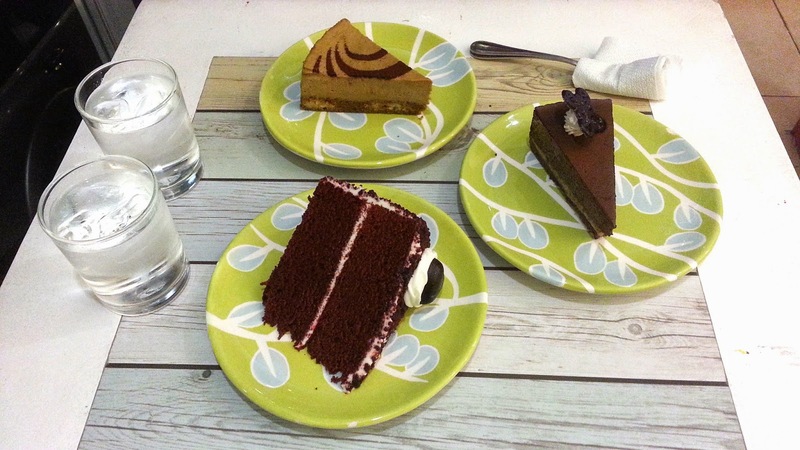 We tried their tiramisu, red velvet cake and Kahlúa walnut pie. It was the red velvet cake I liked best. The Kahlúa walnut pie is chocolate with a hint of the coffee-flavored rum and walnuts, but I didn't like it as much despite it being one of their specialties and bestsellers. We had a proper dinner at the famous Larsian, a short jeepney ride away from our hotel. We got accosted by several stall owners upon entering the place but decided to go for the stall that didn't try too hard to get the attention of prospective customers. I had no idea what kinds of foods one can eat at Larsian in general, but apparently they're all grilled. Rice is served almost bite-sized, compacted in coconut leaves, much like suman, but woven in the shape of a triangular pyramid with a slit in the middle so you can take the rice out. Called pusó and priced at P4 each, they're served to tables in a basket where diners can get however many they want and the number of weaves left on the table after will just be counted for the bill. The highlight of the trip was spending Saturday morning with nature in Oslob, four hours away from Cebu City. 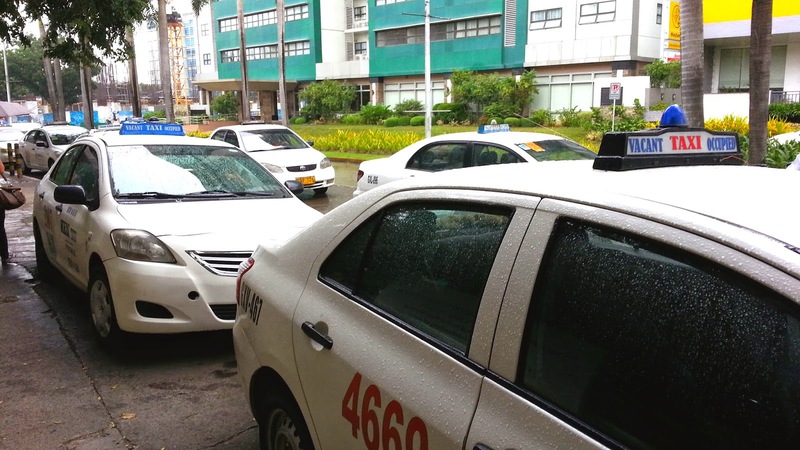 We left the hotel at five and took a cab to "south terminal" where we rode a bus to Tan-awan. We arrived at around nine and headed straight to an unnamed place where people can go swim with whale sharks, locally known as butanding. Or if you're scared of doing so, just watch from a boat while fishermen feed them alamang (tiny shrimp). There's a reason they're referred to as "gentle giants" though. They're harmless. In all probability, they might be the ones afraid of us humans. I do have a fear of natural bodies of water, as I have mentioned in past blog entries, but having been on a YOLO state of mind for a while now, I was really looking forward to swimming with the butandings. 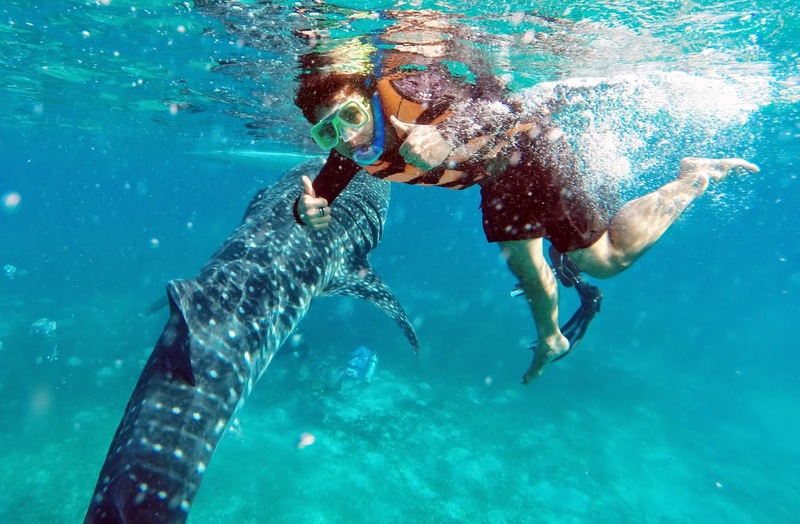 We first listened to a mandatory five-minute orientation which discussed rules to watching and swimming with the gentle giants, such as no applying of sunblock before heading out to the waters and not touching them or even getting within 10 meters of them. Then we paid a fee of P500 each to snorkel for thirty minutes (it's P1,000, if you're a foreigner). 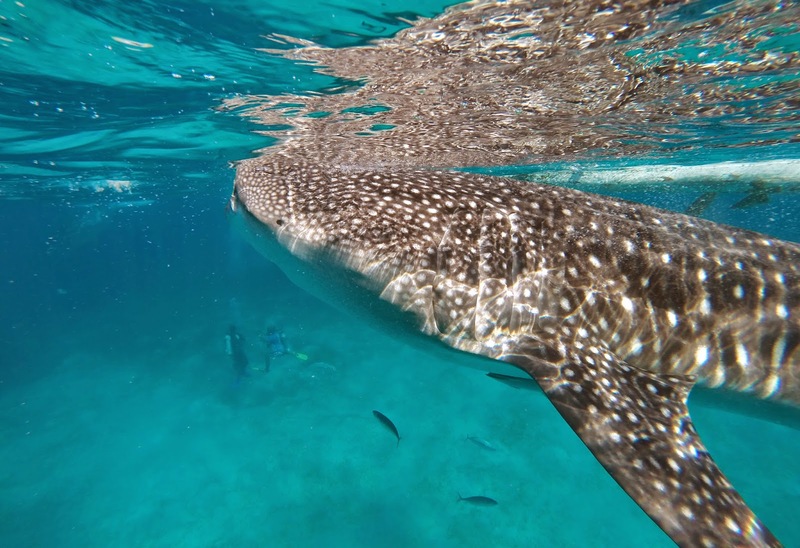 The spot where they take you to watch whale sharks isn't far from the shore. I asked the fishermen on our boat how many of the majestic creatures usually come out in the area and he said about a dozen and only in the morning, which is why whale shark watching is only confined to that time of day. Best to go after dawn when the waters are still calm, but if you'd like to see the gentle giants better (also for better photographs), a later time when the sun is higher up in the sky would be optimal. I had borrowed a GoPro camera from a friend and thankfully had two good photos (out of many, many burst shots) of myself with a butanding taken by my Cebu companion. 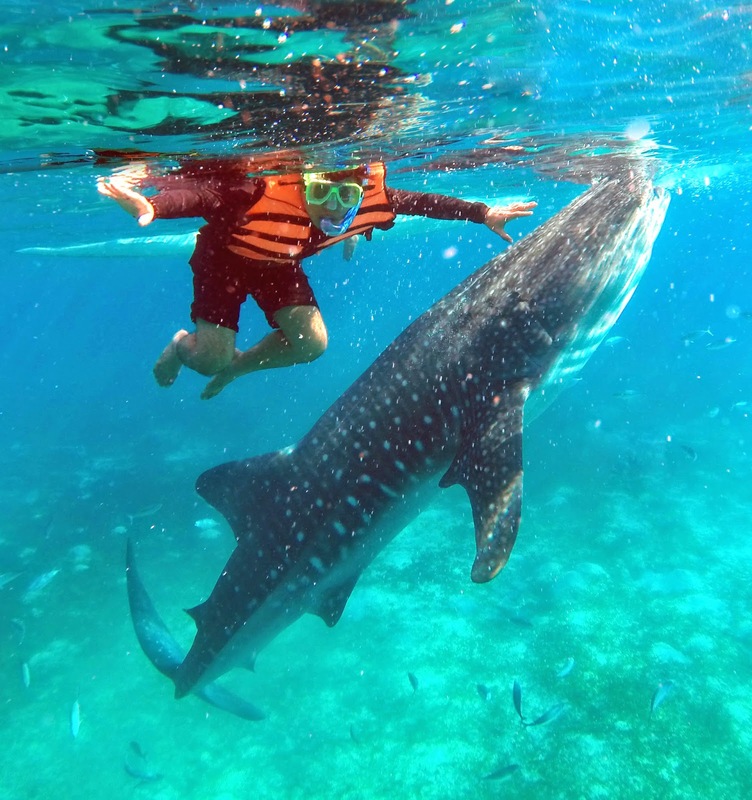 About five minutes before our time was up, I decided to remove my vest and snorkel goggles in hopes of getting a better shot of myself with a whale shark, but my friend had already stopped taking photos. After that amazing swim, we had tocino, eggs and coffee for breakfast, bought some souvenirs and hired a "multicab" driver to take us to Tumalog Falls (for P200, back and forth). 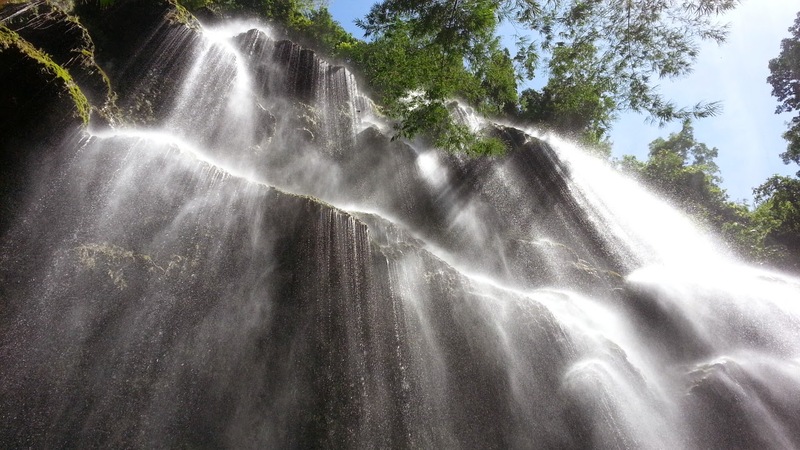 Tumalog Falls is by far the most magnificent waterfalls I have seen in person. The weather was perfect for gazing up at the cascading waters. The sun hit each drop beautifully. Being used to the harshness of urban life, such a view to me was ethereal. We stayed at the falls for an hour, because that was the time we told our driver we'd be away for, and then we headed back to the city, collapsed on our beds and stayed in our hotel room watching cable TV until our flight home the next day. Locals speak either Bisaya or English, or both, but rarely Tagalog. Just like you would if you were in Iloilo or Bacolod, you say "lugar lang" to alight from public transport, which we were mostly dependent on since we were traveling on a budget. 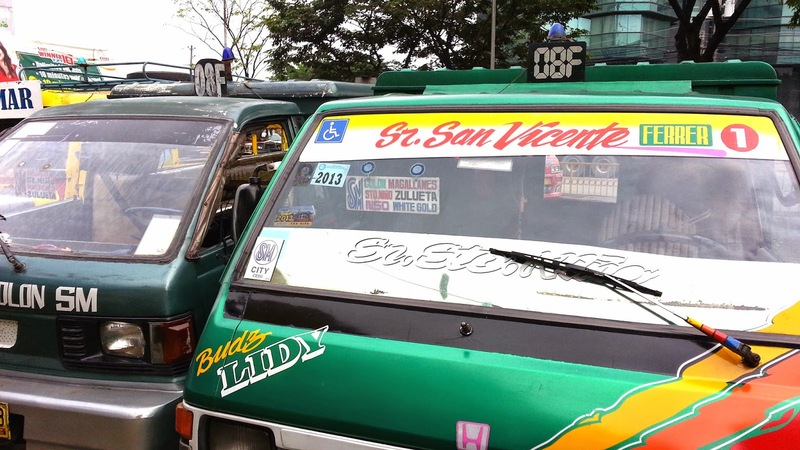 I liked how Cebuano jeepneys had an alphanumeric system to them, making them easy to spot even from afar, though difficult to memorize what destination each of their alphanumeric combinations represented. When we needed to take a cab at night, we were able to rely on cabs' roof lights to let us know whether they were vacant or occupied, literally, because their lights will either be on the word "vacant" or "occupied." 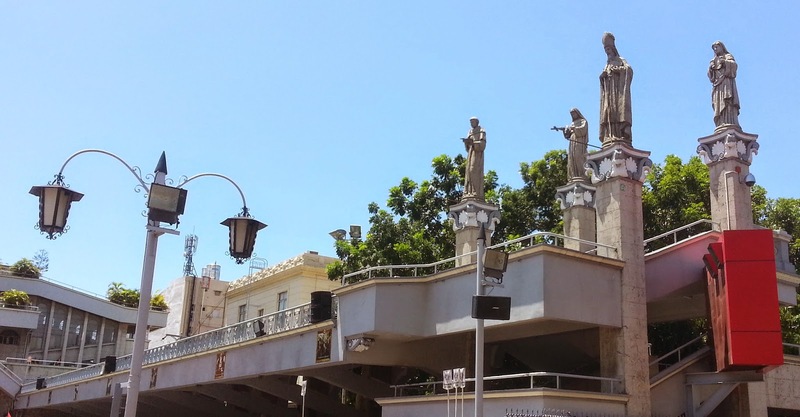 Cebu is a pleasant place overall. Our itinerary surely wasn't enough to let me experience all things Cebuano, so I'm definitely going back. Especially for the lechon and the butandings.